Tyson Foods is an American multinational corporation operating in the food industry with its headquarter based in Springdale, Arkansas. It is one of the largest processor and manufacturer of ground beef, chicken and pork supplying meat to chains like McDonald’s, Burger King, Wal-Mart and many more. Being the second-largest food production company in the Fortune 500 and a member of S&P 500, the company provides only with the highest quality of food and services. Tyson employs over 122,000 people currently, working at more than 3000 facilities distributed all over 32 states of the United States and 22 other countries. Working with Tyson Foods helps you provide services with a real impact. Under excellent leadership, working with this company will give you experience in all arrays of entrepreneurial setup. If you’re looking for advancement in your career opportunities, Tyson Foods is looking to hire people for management and hourly positions. Age Eligibility @ Tyson Foods: The permissible age to work with the company is 18 years. Career Opportunities @ Tyson Foods: There are many hourly and managerial posts for candidates in different departments including Administrative, Laborers and Helpers, Maintenance, Managerial, Operations, Promotional, Service Providers and Technical Help. History: John W. Tyson started Tyson Foods in Springdale, Arkansas in 1931, and the company then went by the name of Tyson Feed & Hatchery. By 1945, the company was incorporated. Years down the lane, John and his son Don made a dynamic duo, and the business flourished. In 1963, the company went public. In 1969, the company acquired Prospect Farms, Inc. In 1972, the company had also acquired Ocama Food Division of Consolidated Foods. In 1984, Cobb, Inc., and Tyson joined hands to start a new venture called Arkansas Breeders to breed and develop a female with low fat, fast growth, and high meat content called the Cobb 500. Also, Tyson acquired 90% of another poultry firm, Valmac Industries. By 1992, the company had acquired Arctic Alaska Fisheries Corporation and Louis Kemp Seafood Company to diversify its operations in seafood. In mid-2001, Tyson acquired IBP, world’s largest beef processor, transforming the company into the largest diversified meat company in the world. Presence: Counted under one of the world’s largest processors and marketers of chicken, beef, and pork, Tyson Foods is the second-largest food production start-up in the Fortune 500. The company has over 120,000 employees spread over 32 states and has productions in Russia and China as well. Financial Stature: The company’s net income stands at $1.77 billion and its revenue being $38.26 billion. Tyson Foods invests in stock under New York with its ticker symbol being TSN. Community Initiatives: Tyson Food also runs Hunger Relief and Disaster Relief programs. Hunger Relief Program – With over 9 million pounds donated, Tyson Foods has contributed over $3.6 million over the last five years. Disaster Relief Program – Tyson Foods has helped aid for Hurricanes Katrina, Rita and Ike; Superstorm Sandy and many more by providing hot and nutritious meals throughout the country in their disaster relief semi-trailer that can serve approximately 15,000-20,000 meals a day to the victims of the disaster. Working with one of the world’s leading entrepreneurial venture gives your career a boost and allows you to make a real impact. Tyson Foods provides with the opportunity to train under them and learn the ropes of the business. The company is now hiring individuals in various positions on both, full-time and part-time basis. Given below is the list of job openings in the company. There are various departments under Tyson Foods looking to hire individuals with appropriate qualifications required for the jobs. Administrative Posts: People working in this division maintain inventory and keep a stock of everything. Laborers and Helpers: Individuals applying for this division should have good stamina and know how to work consistently on their feet. Maintenance: Individuals applying for this division should have the basic knowledge of maintaining different products and services. Managerial Posts: Working in this division asks for excellent leadership skills and taking initiatives to manage the assigned tasks. Operations: This division handles the services related to the transportation of products. Professional Posts: This division is highly specific and requires qualification in the fields as per the department. Service Providers: This division includes the services mentioned below. Technical Help: Tyson Foods is looking for the candidates for the services listed below. How to Apply @ Tyson Food, Inc.? Click on the following button to get the information regarding hiring application. The hiring application forms are available for a fill. An interview follows the form filling process. Apart from on-site mentoring, Tyson Foods also has a Tyson Leadership College which offers many courses to suit your field of expertise. Tyson Food has a Leadership and Professional Growth department which accelerates both, your personal and organizational effectiveness. Tyson Foods also provides with medical, dental and vision insurance with stock options plans along with competitive salary and bonuses. The company also offers its employees with a 401(k) plan. Job Interview Questions for Tyson Food, Inc.
What are your previous job experiences? What working hours suit you? HomeTown Buffet is a family-style buffet restaurant offering a broad spectrum of mouth-watering delicacies, ranging from energizing breakfast to sumptuous lunches and delectable desserts. With a family friendly, safe and hygienic environment, the buffet offers advance booking for small and large groups. The menu ranges from all-time classic favorites like fried chicken to heaven desserts. The meal also offers a sample menu to help you with your selection. If you love making people smile and have a passion for high-quality food, The HomeTown Buffet is now accepting online job applications offering both part-time and full-time positions. Hiring process starts by filling out an online job application form. The company has over 160 locations and employs almost 40,000 people all over the United States. By ‘92, it had debuted in Forbes under best 200 small companies. Working Hours @ The HomeTown Buffet: Most of the HomeTown Buffet stores function from 10:45 am to 9 pm on weekdays, whereas on weekends, these stores generally open from 8 am to 9 pm. However, the timings may differ according to the location. Age Eligibility @ The HomeTown Buffet: The minimum age to join the organization is 18 years. Career Opportunities @ The HomeTown Buffet: The company offers jobs on the positions of Cook, Line Server, Wait Staff, Dishwasher, Checker, Cashier and other Restaurant Management Positions. History: A buffet chain assuring nothing but high-quality food, The HomeTown Buffet originates from the foundation of Old Country Buffet by Roe Hatlen in the outskirts of Minneapolis. Fast forward two years and the company went public, garnering mass attraction and adoration of the crowd, offering the US favorites like fried chicken and hamburgers. By 1890, the buffet chain adopted a “scatter system” which provided various food at different kiosks rather than lined up at one end. In 1992, the company made an entrance in the Forbes magazine as one of the 200 best small companies. By 1999, the company annexed Tahoe Joe’s Famous Steakhouse. By 2006, it had acquired Ryan’s restaurant group under which Fire Mountain Grill, Ryan’s Grill and Buffet and Bakery used to fall. Buffets Inc. later went by the name of Ovation Brands. Presence: Employing close to 40,000 people, HomeTown Buffet operates 388 establishments in 36 states and franchises in 24 states, the majority of which conducts under two names Old Country Buffet and The HomeTown Buffet. The remaining entities go by Country Roadhouse Buffet and Grill, which display cooked good and grills and Original Roadhouse Grill, a steakhouse offering a menu-format wide selection of meat. Financial Stature: The company invested in NASDAQ and had a revenue sale of $868.9 million (1998). Additional Services: The buffet also provides the customers with gift cards and are open to small and large group bookings. Community Initiatives: The HomeTown Buffet also organizes various fund-raising campaigns, for which you can apply online. The job encompasses young, bright and energetic individuals for both part-time and full-time positions, which can take responsibilities and initiatives. The role also asks for impeccable leadership qualities and exemplary people skill. The HomeTown Buffet job application form is available online as well as a printable PDF. The candidate must be over the legal age of 18 years to apply for the job. The HomeTown Buffet currently offers the following openings. The job descriptions are explained in the job titles below. Cook: Presenting with an opportunity to work with one of the best food chains in the US, the job offers working on different stations, honing your culinary skills. The task challenges your working under pressure conditions while acuminating your comestible skills. Line Server: If you love putting a smile on people’s face and can anticipate someone’s need, line serving is for you. In the midst of the most interactive part of the food industry, line servers create orders and explain the menu to the guests while maintaining an inviting environment. The job requires a lot of initiative and confidence. Wait Staff: Ensuring provision of optimal level service to the customers, wait staff is expected to maintain knowledge of the menu and offer the services to the customers, along with providing suggestions and relaying information to the kitchen. Dishwasher: Maintaining excellent hygiene and working under pressure, dishwashers are responsible for the provision of clean utensils at all times. Checker: One of the most grueling jobs, it entails memorizing products code, counting cash, maintaining credits and debts while handling cards and excelling in customer service. Cashier: If you’re good with keeping track of money, this is the job for you. A cashier is expected to maintain genuine interactions with both, the customers and the staff. The job entails keeping track of orders, managing the cash inflow and handling credit and debit cards. The Hometown Buffet is also looking for candidates for the managerial positions. If you excel at communication and can readily take initiatives, then you can apply for these posts. How to Apply @ The HomeTown Buffet? The hiring application forms are available as application PDF as printable application forms. The employment forms are also available for online fill out. This is followed by an interview, in which you will be judged on your leadership and your customer handling skills. The company offers multitude job benefits in addition to the competitive salary to the employees. Starting with a comprehensive training program, they offer five days a week flexible working schedule, paid vacations, bonus plans, free meals on duty along with medical and dental plans for full-time employees. There are also ample training and development opportunities. In addition, the employees are provided with a 401(k) retirement plan. What is your previous experience in this field? How will you make our customers comfortable while interacting with you? Will you be able to work additional paid hours if need be? LongHorn Steakhouse is not just any other steakhouse you happen to find down the road. It is known for its exquisite grilled steaks and remarkable food experience and specializes in Texas touch. The Steakhouse is owned and operated by Darden Restaurant, Inc., a company that owns Olive Garden and RedLobster. Its headquarter is based in Orlando, Florida. LongHorn is located at 481 locations all over the United States with over 170,000 employees serving only the highest quality steak, short ribs and such. LongHorn Steakhouse is looking for bright, energetic and passionate people who exceed at leadership. So if you’re ambition driven, looking to work under the best in the field, LongHorn Steakhouse is looking for candidates to fill in part-time and full-time positions. Working Hours @ LongHorn Steakhouse: Daily, the restaurant opens at 11:00 am and closes at 10:00 pm. Age Eligibility @ LongHorn Steakhouse: Candidates above the legal age of 18 years are permissible for the application. Career Opportunities @ LongHorn Steakhouse: The place has various positions including Host, Line Cook, Dishwasher, Server, Bartender, Restaurant Manager, Service Manager, Culinary Manager and Bar Manager. History: The restaurant was found by George McKerrow Jr. and his father in 1981. The original location was at Peachtree in Atlanta, Georgia. McKerrow was a former manager at the Victoria Station when he filled the restaurant with western paraphernalia and served the signatory steak with butter sauce. In ‘82, when the Snow Jam 82 stuck, it restricted the daily commuters and motorists to seek shelter. That is when Logan’s Steakhouse, which at that time went by LongHorn Steaks restaurant and Saloon, came up with $1 menu, gaining popularity and public adoration, flocking the mass even when the storm had subsided. A decade later, the franchise had ventured south, expanding even to the Midwest, South West, and Puerto Rico. Primarily, the franchises are centered in the Eastern area. In 2007, Logan’s Steakhouse, which was previously operated and owned by RARE Hospitality International, Inc., was bought by Darden Group of Restaurants. Presence: With close to 500 restaurants all over the US and a menu of over 30 combinations, LongHorn Steakhouse is famous all over the country. Financial Stature: Logan’s Steakhouse is owned by Darden Inc, and makes $1.7 billion annually, 1.9% of which goes to the tax. In 2012, the company earned $1.1 million in sales and $3 million in average unit sales. Additional Services: LongHorn Steakhouse offers gift cards and eClubs to the customers with appealing offers. Harvest – In partnership with Food Donation Connection, it’s weekly program where the best quality food is given to the people in need. RedCross Annual Disaster Giving Program – LongHorn and other members of the Darden family come together to help feed people during any natural disaster. Darden Dimes – A program funded by team members where the Darden family provides more than $15 million in assistance to co-workers in need. Tip a Cop – A unique program where the company unites with the police force to feed the special Olympics. The First Responder – A date selected program where we provide free appetizers to police, firefighters, and EMTs. Environmental Initiatives: LongHorn Steakhouse appoints a “sustainability team” that reduces water wastage, recycles cardboard and plastic, and donates food to food banks. The organization also partners with National Cattlemen’s Beef Association, the U.S. Sustainable Beef Coalition, and the Global Roundtable on Sustainable Beef to improve practices. To apply for the positions at LongHorn Steakhouse, visit the website and fill up the LongHorn Steakhouse online application form for both hourly and managerial positions. Below, the job titles are explained for better understanding. Host: If you love interacting with people and can put a smile on people’s face, you can apply for this position. The role of a Host is to be warm and welcoming to the guests, providing them with a comfortable environment. Line Cook: We are looking for exemplary individuals who can innovate dishes, and can also prepare meals with our standard recipes. Server: The responsibility of a Server entails constant communication between the guests and the kitchen. A Server should be excellent at multi-tasking and should memorize every dish on the menu. Dishwasher: A Dishwasher has to maintain the hygiene at all times and check the availability of fresh and clean utensils for serving the food. Bartender: A Bartender innovates and recreates drinks, while also specializing in the regular drink menu. The Bartender should be communicative and friendly, making the guests feel at ease. Restaurant Manager: This is a position which requires you to hold critical roles in the entire restaurant. It requires excellent leadership qualities and prior experience in the field as well. Service Manager: The responsibility of a Service Manager is to develop and lead the team to keep the guests happy and comfortable. Culinary Manager: This position allows you to manage, present and lead the productions of the kitchen, ensuring that the food served always lives up to the quality of the restaurant. Bar Manager: A Bar Manager keeps a stock of the bar and manages the shifts and hours out it by employees. The LongHorn Steakhouse also provides with a comprehensive Manager-In-Training (MIT) program for you to constantly grow and develop in the field. How to Apply @ LongHorn Steakhouse? To apply for the positions in LongHorn Steakhouse, click the button below and fill out the online application form. Along with competitive salary and weekly pay, LongHorn Steakhouse also provides with quarterly-performance based bonuses with paid vacation and flexibility of working days. LongHorn also provides the employees with medical/dental/vision insurance, and short-term and long-term disability insurance with employee assistance program. The company has flexible spending accounts. LongHorn Steakhouse also has an employee stock purchase program and Darden employee credit union, along with tuition reimbursement and 401(k) plan. Among additional perks are auto, home, and other renters, insurance discount, pet insurance, prepaid legal policy, and dining discounts. What is your previous experience in the field? If you’re looking to crack open a cold one with the boys while gorging on soul-satisfying steak, Logan Roadhouse is your spot. Mostly known for its mouthwatering grilled meat, Logan Roadhouse is a laid back steakhouse offering free buckets of peanuts for you to snack on. Logan’s Roadhouse is a chain of restaurants, revisiting the classic American traditional roadhouse from days past, upping the ambiance with rich interiors and coveted steaks, chilled beer, and a jukebox. Found in Lexington, Kentucky, the United States in 1991, it has 194 company-operated and 25 franchised locations in over 23 states. If you’re passionate about working in an upbeat atmosphere and providing high-quality services, Logan’s Roadhouse is now accepting job applications for both part-time and full-time positions. You can apply online by visiting the site and filling out the job application form. Working Hours @ Logan’s Roadhouse: The Logan’s Roadhouse Steakhouse opens at 11:00 AM and closes at 10:00 PM on workdays. On Saturday, it opens at 11:00 AM and closes at 11:00 PM, while on Sunday, the Steakhouse remains available for the customers from 11:00 AM to 10:00 PM. Age Eligibility @ Logan’s Roadhouse: The permissible age limit to work here is above 18 years. Career Opportunities @ Logan’s Roadhouse: The posts up for grab are General Manager, Restaurant Bar Manager, Restaurant Kitchen Manager, Restaurant Service Manager, Quality Assurance and Food Safety Manager. History: Logan’s Roadhouse, Inc. is a chain of restaurants dispersed all over Tennessee, Kentucky, Indiana, Alabama, Georgia, Virginia, West Virginia, Florida, Louisiana, Ohio, Texas, Oklahoma, and the Carolina, headquarters being in Nashville, Tennessee. Established in 1991, Logan’s Roadhouse opened where previously a western-style steakhouse was lodged. The founders, Dave Watchel and Charles McWhorter, took the company public in 1995, generating more than $13 million in net proceeds. The company traded on NASDAQ under RDHS ticker, their stock debuting at $13.50 and immediately climbing to $17.50. Moreover, the firm added six new sites in 1996 and nine locations in 1997. By the end of 1998, it was handling 41 company-operated and 4 franchised restaurants in 12 states. By December, a Tennessee based restaurant developer CRBL, which is also the parent company of Cracker Barrel Old Country Store Inc, purchased Logan’s Roadhouse. Presence: With over 5000 employees on board, the company is now spread over 230 locations in the United States, out of which, 94 are company operated, and 25 are franchised in more than 23 states. Financial Stature: Wholly owned by CRBL Group, Logan’s Roadhouse has the revenue of $315,745,000, and its net income is $9,760,000. The company trades on NASDAQ under RDHS ticker. Additional Services: The Steakhouse provides the customers with gift cards, military discounts, and bulk orders. Community Initiatives: Logan’s love is an employee assistance fund started by the Logan’s Roadhouse team members which allow them to assist their colleagues in the times of extreme economic hardship due to catastrophic events beyond their control. Logan’s Roadhouse is looking to hire bright and energetic individuals with excellent leadership qualities and managerial skills. If you’re good at interacting with the staff and excel at organizational skills, then fill out the Logan’s Roadhouse online application form. The job descriptions are explained by the job titles below. Quality Assurance and Food Safety Manager: This position requires 10 years of prior work experience in restaurant quality assurance or food safety position, and continuous vigilance over maintaining the food quality. General Manager: The General Manager oversees everything that goes about in the restaurant and keeps track of the employee hiring and working hours. Restaurant Bar Manager: The Bar Manager must keep stock and handle all the responsibilities that come with the bar, including monitoring supplies, delegating work, hiring staff and deciding the working schedules among various other duties. Restaurant Kitchen Manager: The Kitchen Manager keeps the stock of the fridge and manages the staff along with observing and maintaining the food quality. In simple words, they run the behind scenes of a kitchen. If you excel in leadership qualities and hold the ability to communicate orderly and smoothly, then this position requires at least two years of hands-on experience in restaurant management. Restaurant Service Manager: Restaurant Service Managers ensure that the food looks presentable and if it’s cooked properly. They also assure that the staff is educated on food safety procedures and understand health standards. How to Apply @ Logan’s Roadhouse? The hiring application forms are available on the website for online fill out. It is then followed by an interview where you’re judged on your customer interaction along with managerial and organizational skills. Onboarding program – An hourly program for managerial and team member positions. Leadership Unplugged program – A week-long program centered in Nashville for the management trainees. Leadership Encore Program – A 3-4 day long program based in Nashville for the general management trainees. Leadership Headliner Program – It is for potential multi-unit leaders. Raise The Bar – Specifically designed for the bar management trainees. Jam Sessions – The boot-camp style training programs for specific purposes. Logan’s Roadhouse also offers vying salary and bonuses with health, dental and vision care coverage along with company paid insurance. The company also pays for short and long-term disabilities with family/medical and personal leaves. The employees can also avail of voluntary optional life, accident or critical illness insurance. Logan’s Roadhouse also provides with 401(k) retirement and family discount plan. Walmart Stores, Inc., globally perform businesses as warehouse membership clubs, superstores, and discount department stores along with several outlets. For the knowledge of the common public, the company operates its business in three different sectors: International, Wal-Mart Stores, and SAM’S CLUB. Out of these three divisions, Wal-Mart Stores are the prime section producing almost 67.3% of the total business alone every year. The departmental store is proud to serve 200 million customers and corporate clients every week. For the 2012 fiscal year, the brand has planned to achieve targeted sale above $444 billion. Before caring for store guests, the company first provide quite a lot of employment benefits to its employees. Workers as per their convenience can apply for either part time or full-time vacancies. 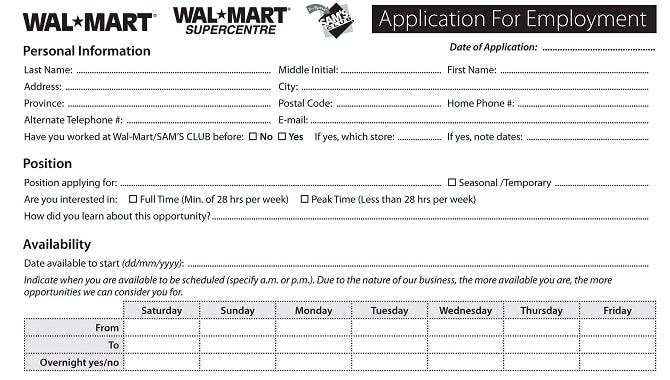 Fill out Walmart’s job application form today and get detailed information. Working Hours @ Walmart: In order to provide excellent customer services, the store works 24*7. Age Eligibility @ Walmart: Before appearing for the interview, you should be 16 years old or above as per organization policy. Career Opportunities @ Walmart: Store Associate, Money Center Associate, Customer Service Representative, Stock Associate, Housekeeping Associate, Greeter, Cashier, Optometrist, Assistant Store Manager, Store Manager, Pharmacist, Automotive Sales Associate, Beauty Sales Associate and Tire Sales Associate. History: Samuel Walton, the owner of this brand name, established the store in order to provide excellent customer service, work environment, and products at cheaper costs. The departmental store was opened in the year 1962 by Mr. Samuel Walton and his brother. The first branch was centered in Rogers, Arkansas. The company performs duties on three basic principles: 1) Service to Our Customers, 2) Respect for the Individual and 3) Strive for Excellence. Walmart got registered on New York Stock Exchange in the year 1972. Presence: Walmart in international market functions over 4,000 different sites in 14 countries, such as Argentina, China, Honduras, Canada, Costa Rica, Brazil, Chile, United Kingdom, Guatemala, El Salvador, India, Japan, Mexico, and Nicaragua. Walmart as a brand globally operates using several different banners like Todo Dia, Despensa Familiar, and Pali. Additional Services: This retail chain departmental store satisfies its customers and clients by manufacturing a variety of durable products and services. You can shop here for home appliances, toys, clothing, furniture, sporting goods, gardening, cosmetics, stationery, toiletries, jewelry, baby, and pet needs electronics, books, food and photographic equipment, etc. Community Initiatives: In terms of serving communities, the brand is seriously indulged in various social and corporate events. An organization known as The Walmart Foundation is supporting those communities which are taking care of retail store chains. To cure societies from natural disasters, the company has contributed millions of dollars. The foundation also collects for charities for fighting hunger, providing scholarships for students and aiding military veterans. The organization has been awarded several times for its effortless contribution towards communities. Environmental Initiatives: The Walmart Corporation besides helping societies also cares a lot about the environment. It is running quite a few programs to prevent Earth and its natural resources. The store has started reducing its waste outputs, doing research on its environmental impact and controlling its energy expenditure. Walmart leads many environmental events and posts online coverage for its regular customers and clients. Financial Stature: Walmart is a publicly traded company. It uses names, such as FRA, LIM, and NYSE under the ticker WMT. The brand in the year 2010 recorded total sales of more than $418 billion. At the international level, the store alone does the business of 30%. Cashier: As a cashier, you will be highly responsible to manage all the cash transactions on daily basis. After getting this post, you will have to help customers with their purchases and making payments. Your chief duties are to checking prices, answering questions, operating registers, credit card machines and handling a large sum of money. In the starting, your salary will be $8 to $10 per hour. Sales Associate: This is again an entry level job position which includes duties, such as assisting store guests and stocking up all products. Other tasks are answering questions, checking expiration dates, finishing additional jobs as assigned and organizing displays. Sales associates again receive a minimum pay of $8-$10 for every hour they spent in the store. Greeter: The main role of greeter at Walmart is to greet all the customers and corporate clients visiting the stores. As a greeter, you should possess courteous, friendly, helpful and gratifying nature. A lot of company’s success depends highly on work performance of greeters. Stock Associate: Walmart’s stock associates are required to care for refilling stocks, rotate merchandise if necessary and check expiration dates. Additionally, you need to manage the basic necessities of the store. Management: People coming to the management level need to daily check and operate store operations. Positions which are designated as management post includes Department supervisor, assistant manager, and store manager, etc. Supervisors are responsible for hiring the right applicants, scheduling and training them. This designation makes you earn a handsome salary in between $30,000 to $60,000 per year. All employees in this company are employed with plenty of on the job benefits, such as flexibility in work schedule, industry-competitive pay and paid job training. Whether you are a new appointment or holding experience, you are eligible for store uniforms and nametags, free meals, and other striking advantages. The list does not end here. More sparkling facilities include 401(k) retirement plan, accident insurance, long and short-term disability, healthcare coverage, paid time off for holidays, personal days, vacation, prescription drug plans, stock purchasing programs and jury duties. Applicants want to successfully clear all rounds of interview at Walmart, should do research study regarding company information and several other general topics. The company chooses the candidates to appear for the hiring. Generally, organization call employee references and uses job portals for appointing the deserving individuals. Below are few important questions which are asked by the interview panel. What type of job role are you looking here for? What made you apply for a job at Walmart? Describe your abilities for which you can be employed here. Are you comfortable working in shifts? How will you manage to work in pressure situations? What do you understand by customer service? Do you have any work experience in sales field?